Currently SOLD OUT of the CHROME until approx April 3rd. 2019. Come back then or order it now and we'll ship it FREE the day we get them in. Email us info@carparelliguitars.com and let us know your interested. Narrow 2 1/16" (modern) string spacing. Fits Strat Style Guitars with 6 Point Bridges*. this unit was on a demo guitar. Never been used was only for looks. The Rail Tail Tremolo is a full contact, dive-only tremolo designed to retrofit your existing Strat®-style 6-point tremolo with no modifications to your guitar; a clever design merging the feel and reliability of a hardtail bridge with the flexibility of a tremolo system. Computer designed and precision-machined, the Rail Tail achieves maximum performance and stunning appearance without compromising comfort or feel. Its unique features allow for adjustability to fit a variety of guitar bodies and for an easy DIY installation. 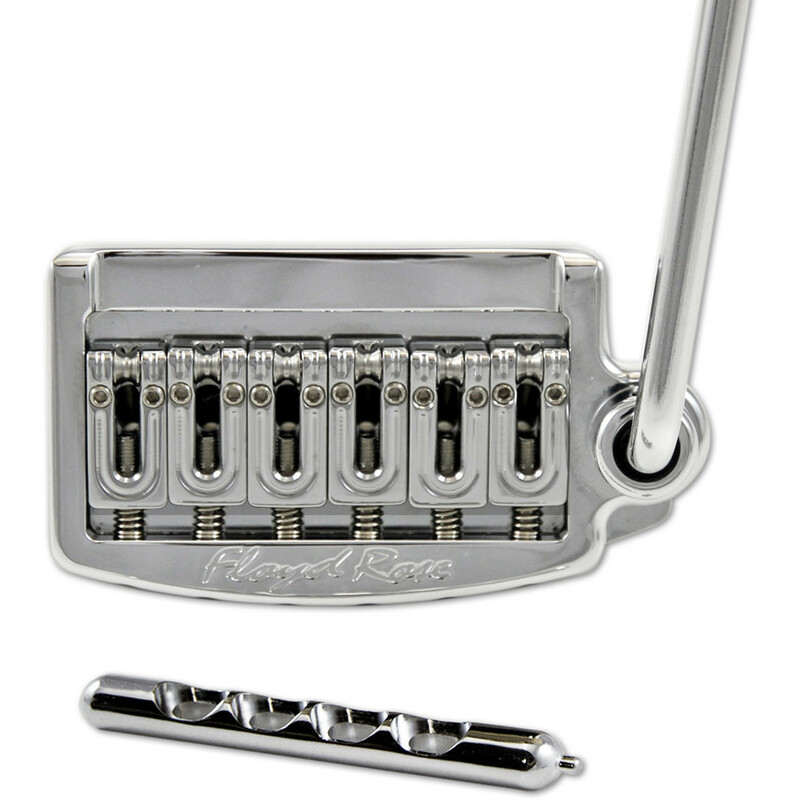 Unlike the original tremolo design that rocks on a bevel located under the screw heads, the Rail Tail tremolo plate rotates around a precision rail that is mounted directly to the guitar body. The plate cradles the entire rail with precision as if they were one unit improving sound quality and tuning stability. This union also creates a greater breakpoint allowing open strings to maintain pitch when bending another, much like a hardtail. The tremolo plate consists of slotted string block mounting holes not only for accommodating installation but also allowing the string block to be positioned forward for greater rotational range. This means diving up to 15 degrees more than conventional tremolo bridges. An advanced string block also consists of game-changing features: Mid-positioned tapered string holes assist in true string saddle contact. Working in alliance with the rail and string block are the roller fitted string saddles. This entire assembly provides ultimate vibrational energy transfer from the strings to the guitar body resulting in better overall sustain and tonal qualities. Available in narrow (modern, 2-1/16") and wide (vintage, (2-7/32") models in Chrome, Black, Gold, Nickel and Black Nickel finishes. Please note:The Rail mounting holes are universal meaning that a narrow spaced Rail Tail will fit onto a wide spaced guitar body and vice versa.